i also have the same problem how can we solve it ? have same problem. iphone 4s error29 pls any solution? i have the same problem error 29 on iphone 4s.....???? yes, it is battery problem. simplest way is replacing battery. the gas gauge wire on the flex makes the problem. because it's at outer side of flex cable and is very thin and disconnects easily. 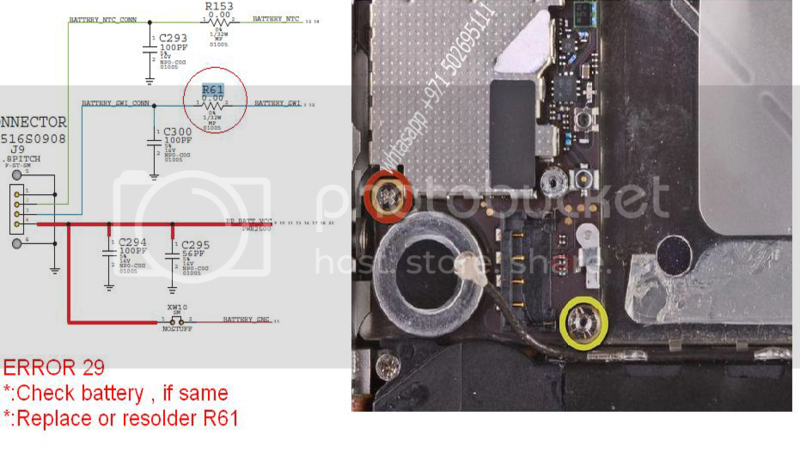 if someone has a healthy iphone 4s battery, share the connection way from socket to battery board. so we'll can do wiring. My iphone 4s error 29 the same ???? How you did to solve it? how you did to solve it please . if still not working try Remove Battery and check the battery ways, there are 4 caps. Make sure that they are all in place and not damaged or corroded. If they are all in place you will need to replace the PMIC on motherboard. If you see damage to caps then you can simply remove them off a different motherboard and add to the phone you are trying to fix.